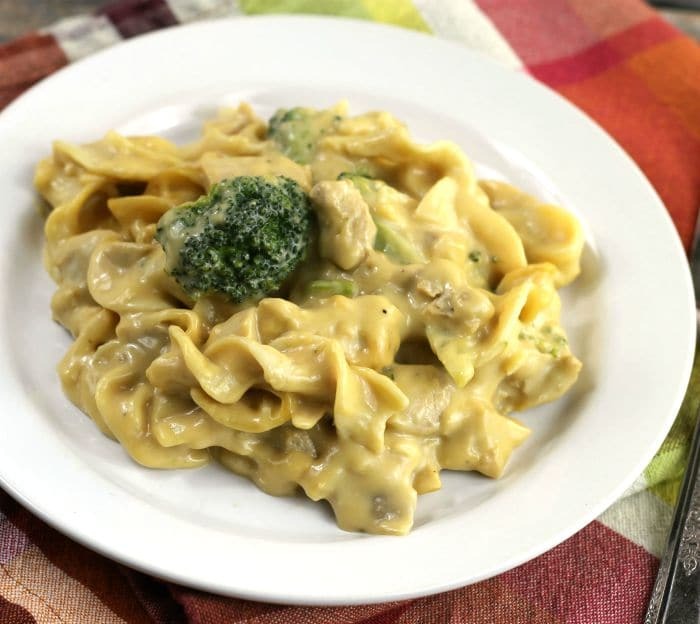 Cheesy chicken broccoli casserole has tender bites of chicken along with broccoli and egg noodles all wrapped up in a creamy cheesy sauce. I grew up eating casseroles, goulash being at the top of the list. Let’s face it, who doesn’t love a good casserole (or where I grew up we called them and still do hot dishes). Casseroles are usually easy to make and usually, kids love them as much as the adults. 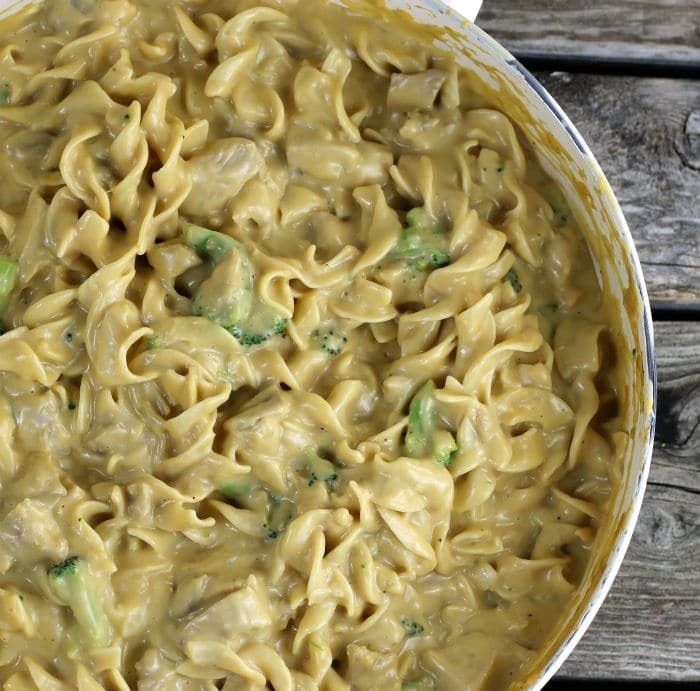 This a casserole that comes together fast and is the perfect meal for any day of the week. 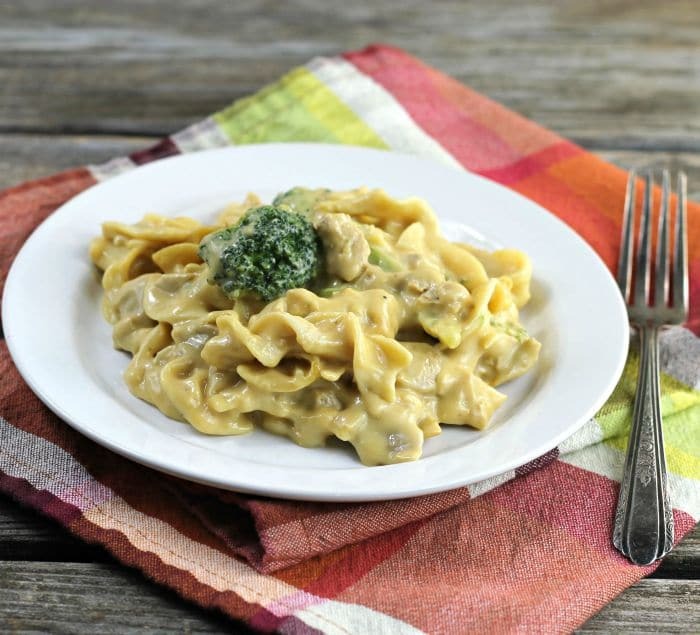 How to make this cheesy chicken broccoli casserole. Cut cooked chicken into bite-size pieces and set aside. Cook egg noodles according to the direction on the box (minus the salt). Heat a large skillet over medium heat. Add two cans of cream of chicken soup, one cup of sour cream, a packet of onion soup mix into the skillet and mix together until the ingredients are well mixed. Stir in two cups of chicken broth. Add the chicken and the noodles and stir in. 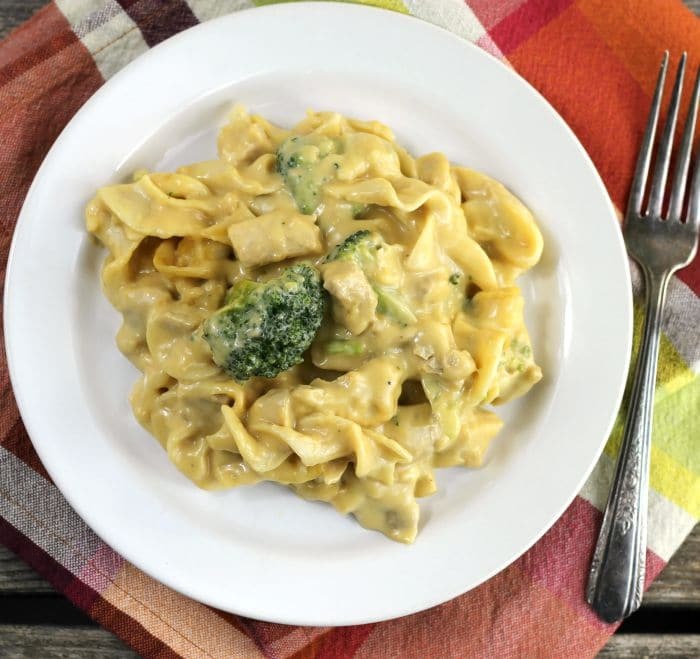 Stir in the cheese and frozen broccoli and mix well. Bring to a boil and reduce slightly and cook for about 15 minutes or until the broccoli is tender. Serve. Cut the cooked chicken into bite-size pieces and set aside. Cook the egg noodles using the directions on the package (minus the salt). To a large skillet add the cream of chicken soup, sour cream, dry onion soup and mix until well combined. Cook over medium heat. Stir in the chicken broth. Add the chicken and egg noodles and mix well. If the sauce is too thick add additional chicken broth. So flavourful and tasty with that creamy sauce! I love the name, “hot dish.” Sounds so inviting! And love this particular hot dish — tons of flavor and cheesy goodness in this. Thanks! There’s nothing like a good hot dish, and this is definitely one! My kind of food and I’ll have to give your version a try! I love casseroles, too, and this one sounds like it’s packed with flavor! In fact, we’re looking for something to make for dinner tonight, and I might have to do a casserole like this. Thanks for sharing, Dawn! !